Over the past century, the hills around Bakersfield and McKittrick have been filled in by houses and oil drills. The mountains just to the south have also changed dramatically, but in a very different way. When Joseph Dixon and Halstead White visited San Emigdio Creek in 1918, the canyon was already being settled, and trees had largely been eradicated from the streambed to make a better pasture for cattle. 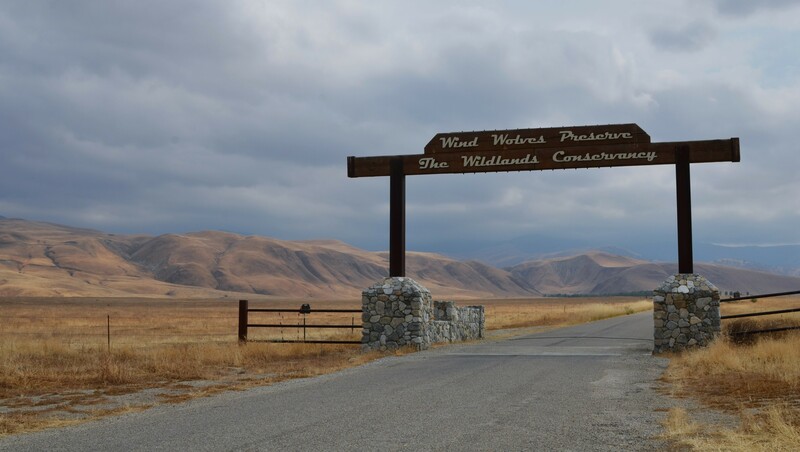 Today, though the golden gleam of invasive European grasses still covers the hillsides, the native trees of San Emigdio Creek have been carefully restored by the Wildlands Conservancy as part of their Wind Wolves Preserve. The welcome sign arching over rolling hills was a much appreciated change of scenery after our gloomy vistas of late. 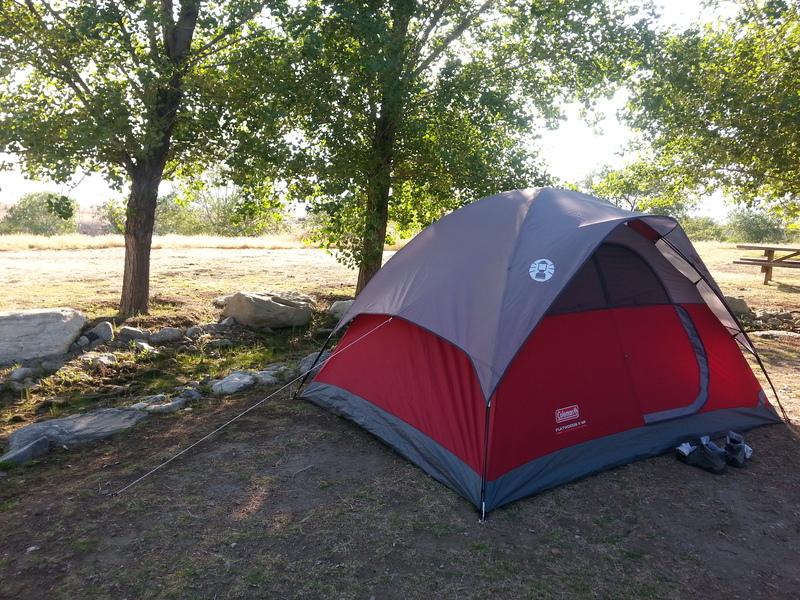 We drove up to the administration building, walked through a garden of native plants and underneath an arch of deer antlers, checked in just beyond a patio with bats chattering in the rafters, and by the time we set up our tents alongside our own personal stream and pond complete with nesting Red-winged Blackbirds, we were in heaven. Unfortunately, all good things seem to have their price. The rain started pattering against the top of my tent around midnight, and despite my hours spent fervently wishing it away, the morning broke beneath a persistent drizzle. Andrea and I fidgeted for a few hours, hoping the storm would blow over. Eventually, the rain softened just enough that we could get our bird survey done for the morning (and not have to spend an extra day here), but we did get considerably wet. Our lunch of soup and hot chocolate was followed by an impressively successful attempt to dry our jackets using my car heater. The rain passed, and the afternoon (and every subsequent day) was gorgeous. 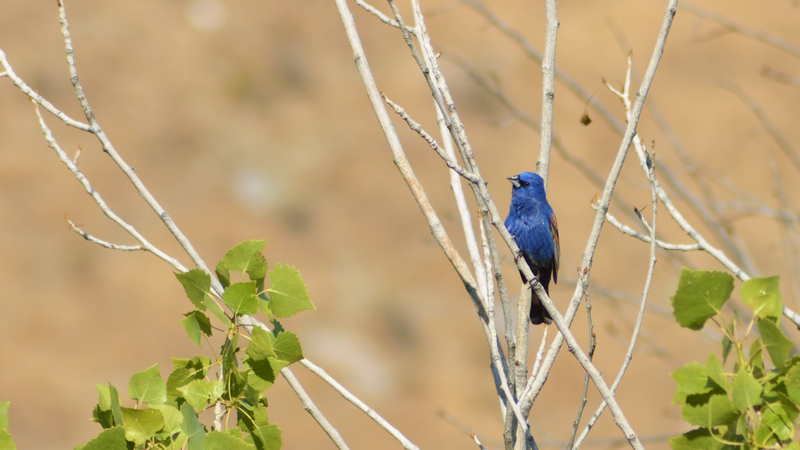 The restored tree belt along the stream was filled with Blue Grosbeaks, flycatchers, kingbirds, warblers, orioles – everything colorful and musical that one could ask for. In the sky above were swallows, swifts, and even a Golden Eagle. 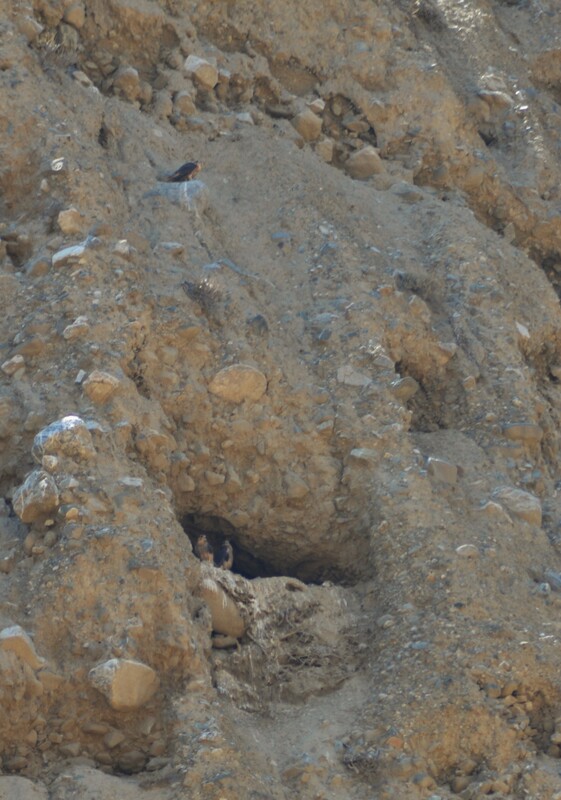 We were told that condors were released nearby, but had no luck seeing one ourselves. Typically after the morning surveys we find ourselves with free time, and so far we’ve often spent it exploring away from our survey sites. But here, the canyon was too beautiful to leave. One afternoon we headed up the canyon past where our bird surveys usually end, hoping to find a Prairie Falcon nest described to us by one of the naturalists at the preserve. We were treated to both adults, as well as three fully-feathered chicks testing their wings on the edge of their nesting ledge. I’m just glad we found our Prairie Falcon nest a little more gracefully than Dixon found his.